Lazonby is a parish, village and township in the Eden district of Cumbria. Before the 1974 local government re-organisation of England and Wales, Lazonby was in the ancient county of Cumberland. Lazonby's Parish Church (Church of England) is situated on hillside above the Eden valley [Photograph No. 1]. 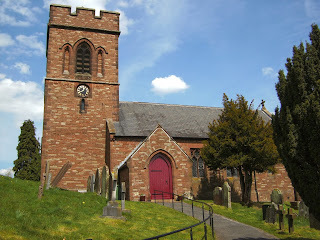 It is believed there has been a church on this site since at least the 12th Century. The present church was completely rebuilt between 1864 and 1866. The parish war memorial, commemorating the parishioners of Lazonby who died in the two World Wars, is located in the churchyard [Photograph No. 2]. It was first dedicated in 1919 to remember the 17 parishioners who lost their lives in World War 1 (1914 - 1918). It was designed by the Rev. Canon Wilson, M.A., Cantab., who served as Rector of Lazonby between 1877 and 1920, and built by Mr William Glaister, a Lazonby builder. In 1949, the names of the 3 parishioners who died in World War 2 were added to the memorial (beneath the list of names for WW1). 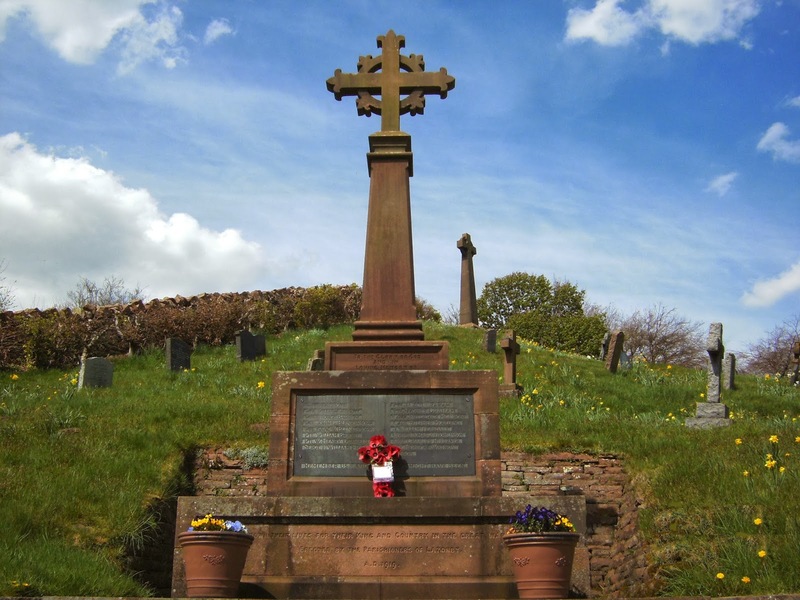 There is a large Celtic cross in the highest part of the churchyard which was built by Mr. W.B. Collingwood and erected in 1902 on the occasion of Canon Wilson's Silver Jubilee as Rector of Lazonby Parish. Canon Wilson's Celtic cross can be seen in the background of Photograph No.2 and Photograph No.3 (above). Four of Lazonby's war dead are buried in the churchyard of their home parish. 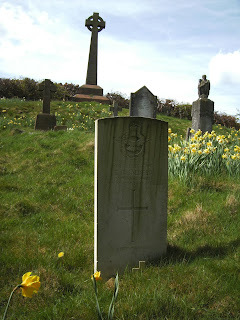 Sergeant Salkeld's headstone can be seen above [Photograph No. 3]. He has a one-word epitaph on his headstone: "Remembrance". Regiment/Service: Royal Air Force Volunteer Reserve, 255 Sqdn. Grave Reference: Sec. B. Grave 25. Son of Robert and Sarah Agnes Salkeld, of Penrith. "Remember us and think what might have been". Erected by the parishioners of Lazonby. In affectionate remembrance of those from this parish who gave their lives in the World War. This article is dedicated to the memory of the parishioners of Lazonby who lost their livs in the two World Wars. It is fear, not death, that slays." The circumstances surrounding the crash that killed Tom Salkeld are described by an eye-witness to the incident, 255 Squadron pilot Michael F. Wynne-Willson, in his Vol.1 of his autobiography. (Wynne-Willson, M.F. (2003). Before I Forget! Bloomington : 1stBooks, p.160-161.) Analysis of the aerodynamic problems of the Mk.II Beaufighter are to be found in Document DSIR23/14491 (Technical Note number Aero 1617) available at The National Archives. This is an original document that requires a TNA Readers Ticket to view, it is not available online. Further discussion on the website of 255 Squadron Association.